We have placed a high value on youth. Yet many of those that I have served through the decades are at the opposite end of the life cycle. What I love about working with people that are older is the history that lives within them. She wanted to show me some pictures. 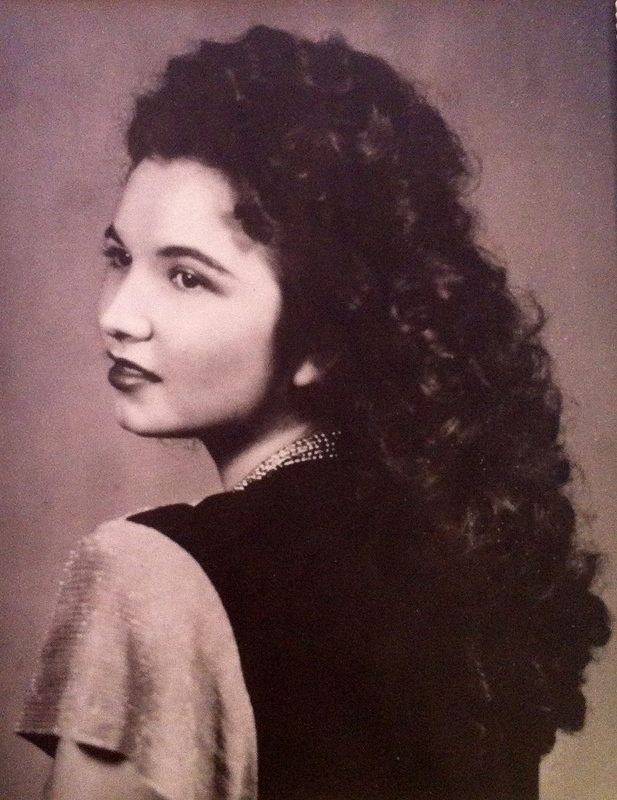 Here is Bonnie at 20 years old, a timeless beauty. I never would have recognized the frail woman in front of me wearing a wig and housecoat as this young woman in the picture. “Just stunning!” I told her. “I was a local beauty queen winner”, she went on to tell me. Her parents never let her leave her little town in Texas to pursue her beauty career however she did go on to learn how to fly planes. I couldn’t imagine how a woman sixty years ago would learn to fly. After buying a second plane from the El Paso Times, she and her husband delivered newspapaers to ranchers in southern New Mexico and Texas by dropping bundles out of planes. Today you would pass Bonnie on the street and never know the pioneer who lives inside. Our youth passes. Our looks fade. I was deeply moved by the outpouring of prayers for our Earth Mother from hearts the world over, all in response to an invitation on facebook to Imagine A World. 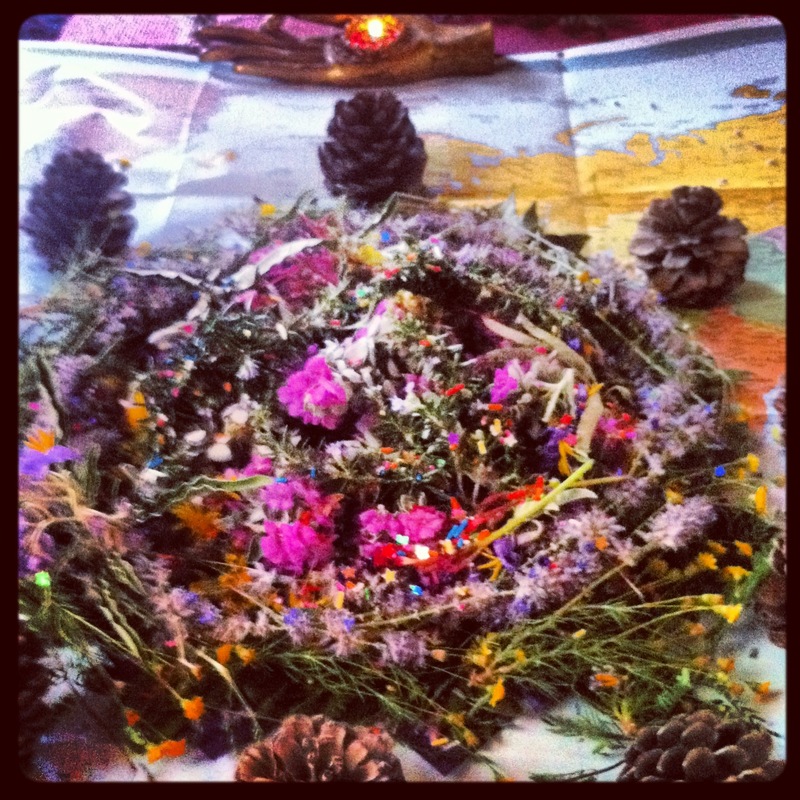 Our Visioning Despacho was created on August 10th in honor of Pachamama Days which correlates to May 2014, a time of blooming and blossoming. The number 10 reflects unity and divinity and speaks to our intentions of visioning a new world. For these reasons, along with August 10th being my birthday, the day felt auspicious! Despacho prayers and offerings are often placed in wrapping paper but as I travel I find myself drawn to maps to orient and anchor prayers to the land. 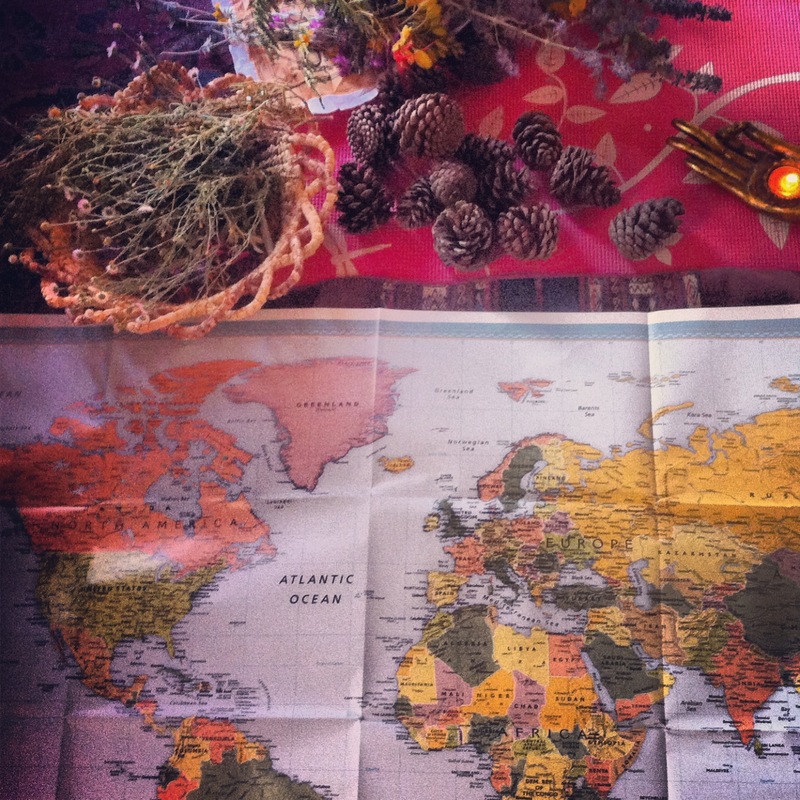 Since our visioning despacho was a prayer for humanity, a map of the world was used. 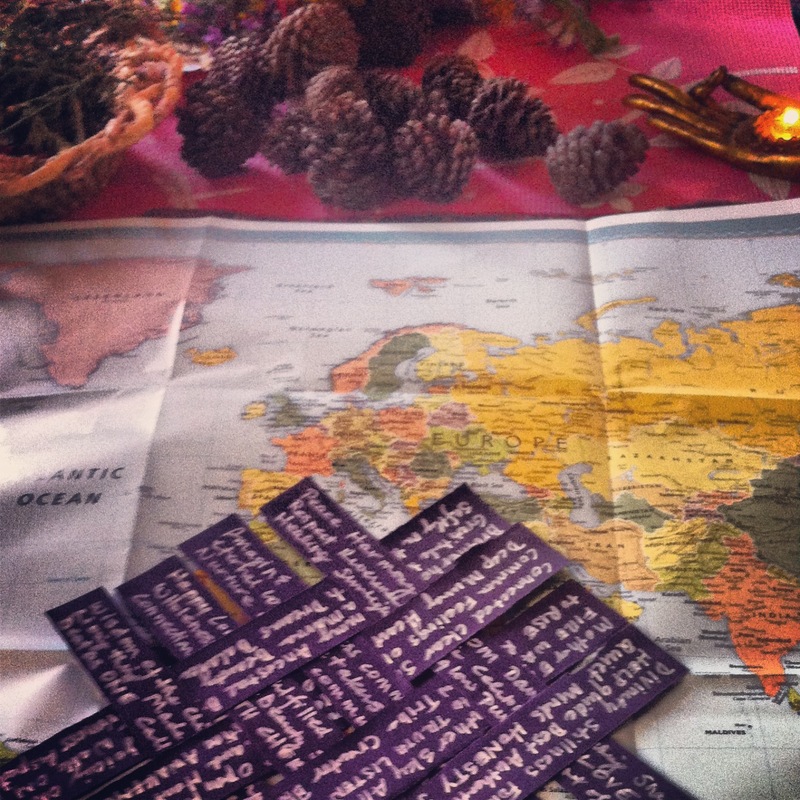 Words from each prayer were written on violet paper, the color of creation. Healing, kindness, love, Oneness, humility, Consciousness, devotion, unity, peace, harmony, abundance. 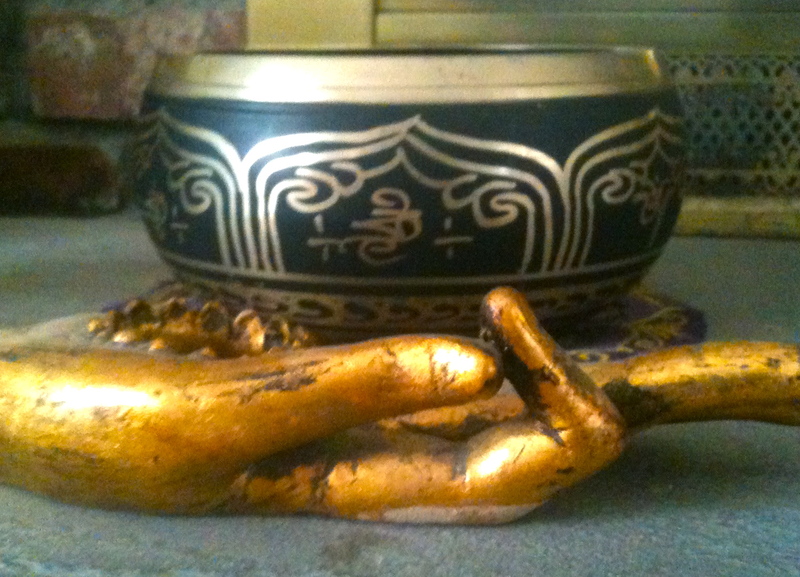 Each day as they sat on the altar, the Tibetan singing bowl rang over these words sending their vibrations straight to Creator on the current of sound. The words were then woven together to symbolize our interconnectedness before being placed in the center of our despacolho. 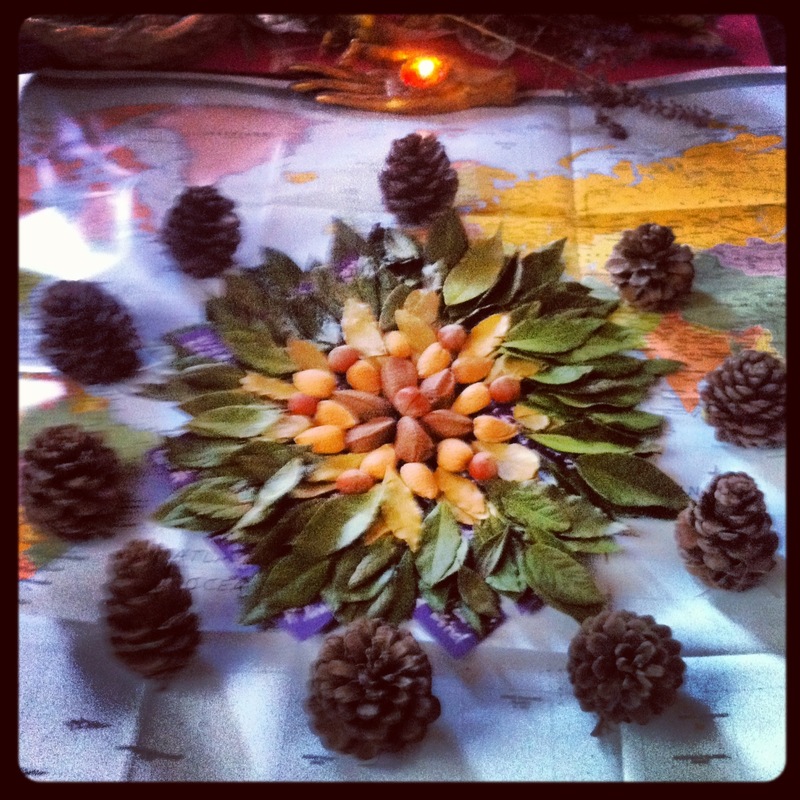 A mandala of whole nuts grown locally in New Mexico remind us of our wholeness, our holiness and the seed potential of each vision. Each prayer was spoken into a qintu made of three bay leaves and radiated out from our holy center. Ten pine cones surrounded our prayers as beacons of light to guide our visions to manifestation. Pine trees are one of the most ancient plants on the planet and our pineal gland, which is intimately linked to our perception of light, is shaped like and named after the pine cone. were offered to feed our prayers and Pachamama. A blanket of cotton quilt lay atop representing the Upper World. Feathers to lift our prayers to Creator and to honor the Apus, for the mountain spirits appear as winged ones, were placed in the center. Gold and silver sugar, sparkles and glitter, violet flowers of creation and colored candies fed our prayers to the invisible realms of Spirit so they may be made visible here on Earth. As above, so below. Tibetan prayer flags were added to honor inclusivity in these times of dissolving borders that have been falsely erected between race, religion, gender, sexuality and a whole host of judgments that divide humanity. 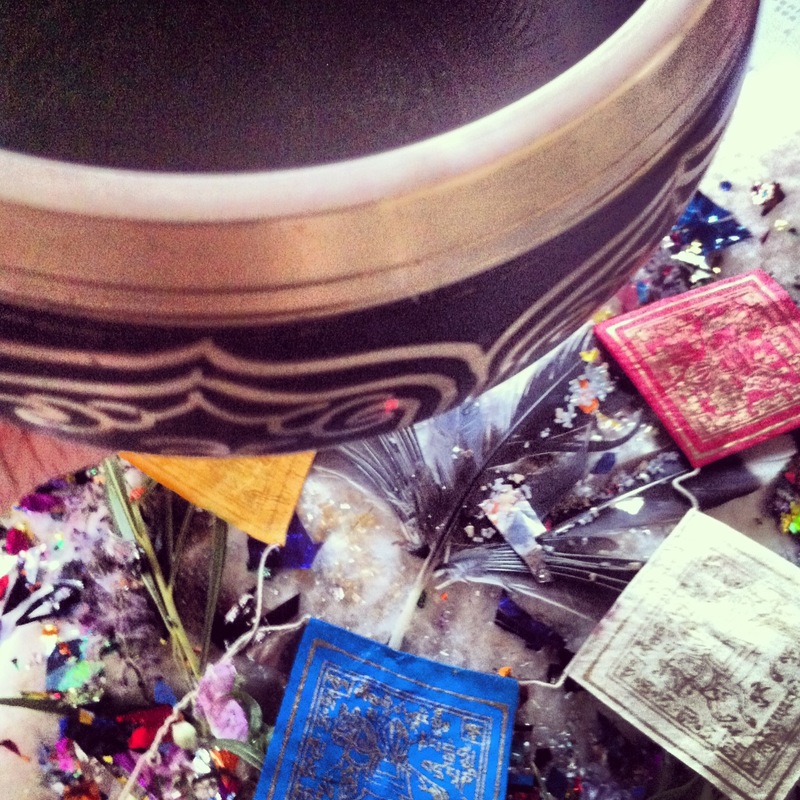 Once complete the Tibetan singing bowl once again sounded. 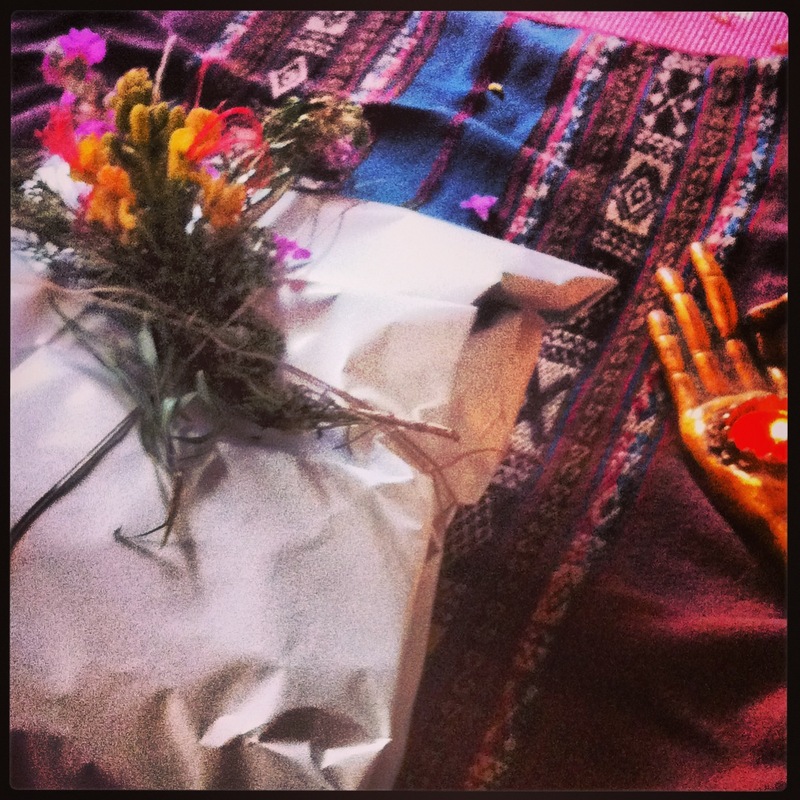 Wrapped in the world map, a forgotten prayer holder of wildflowers was tied to the outside. Prayers are held through time and space until visions have manifested. Under a night sky of gentle rain our despacho sat, a sure blessing in the desert. 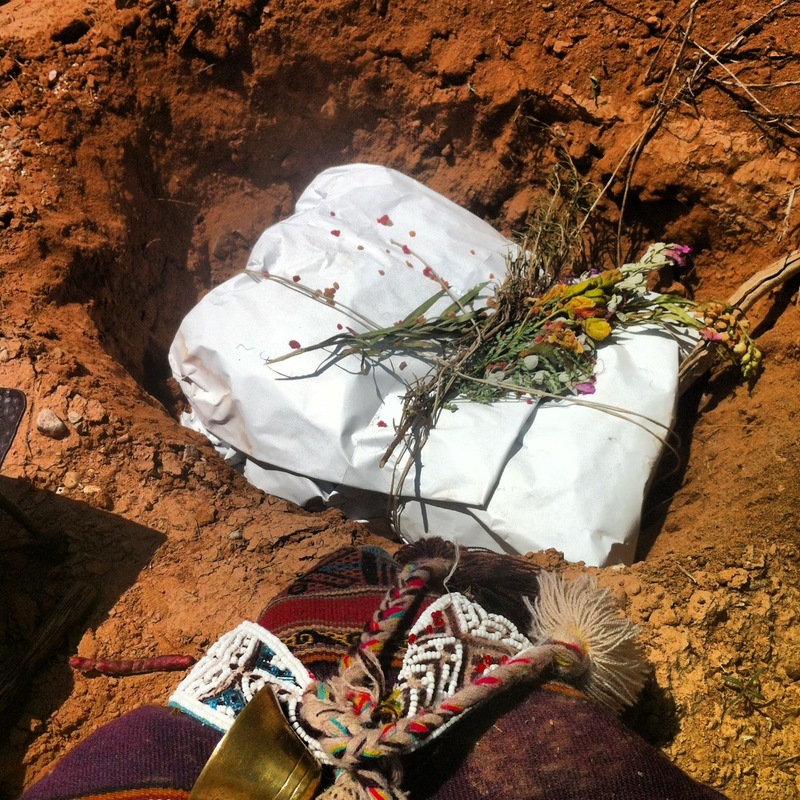 Our despacho was buried in the belly of Pachamama in the deserts of New Mexico. 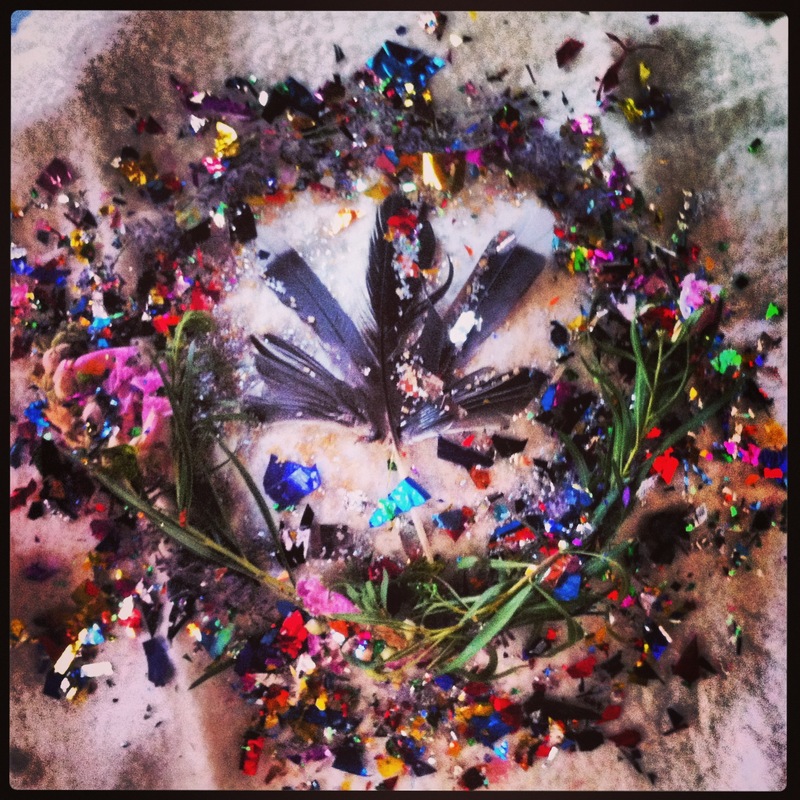 The Earth was prepared with prayer and offerings of sweetgrass, herbs and dried flowers. It is here our visions sit with our Mother, taking root deep in her belly so they may blossom and bear fruit. May she know how much we love her. and it is to you we return. through our ignorance and greed. to walk in a good way. 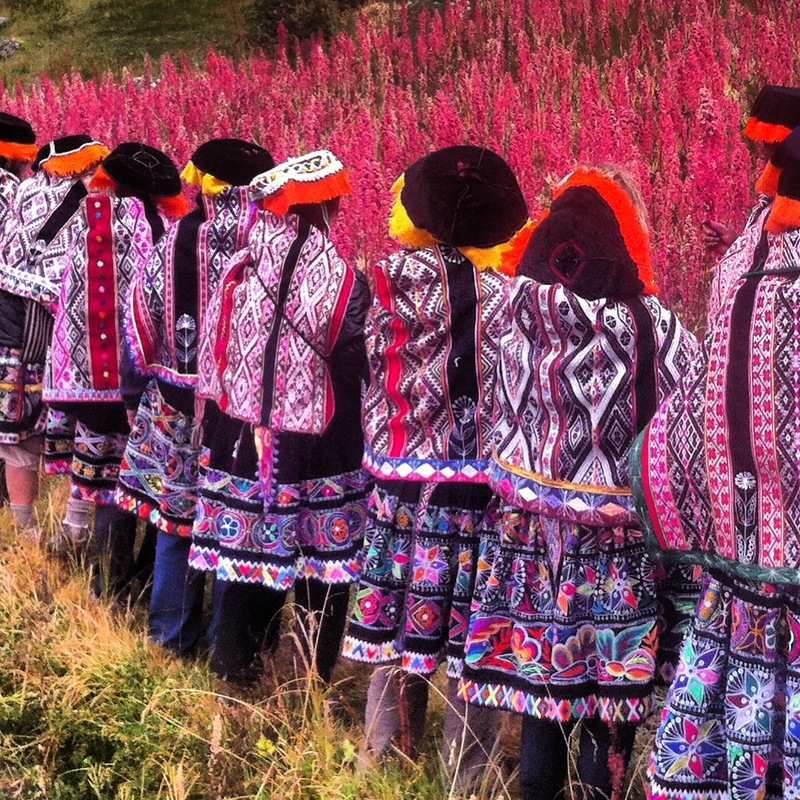 The shamans of the high Andes dedicate the first twelve days of August to honoring Pachamama and dreaming the world into being for the year ahead, a time known as Pachamama Days in Peru. The 1st of August represents August 2014, the 2nd, September 2014 and so on, with the 12th being July 2014. 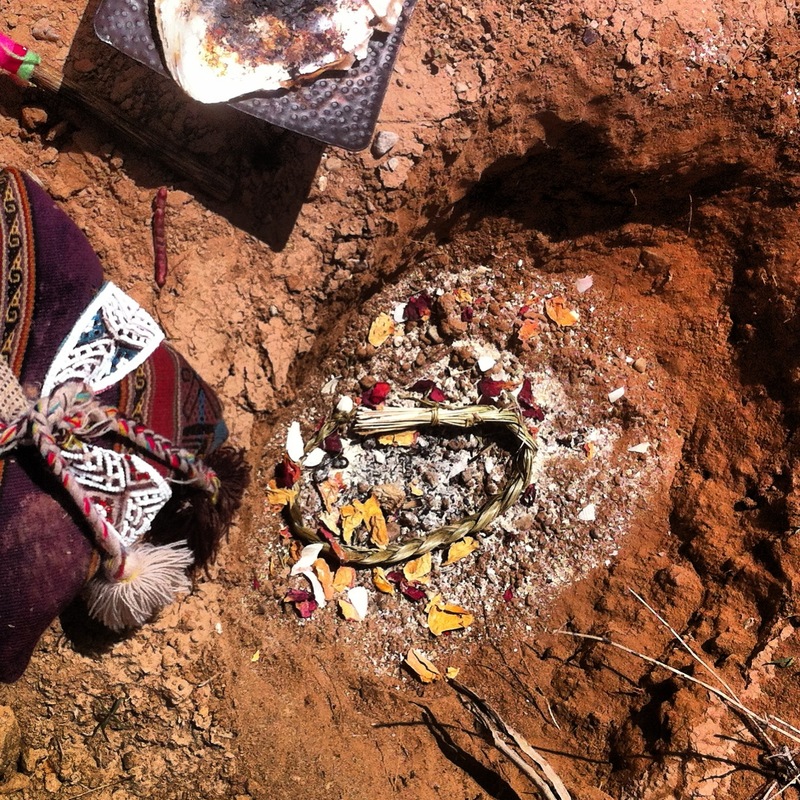 Days are filled with people offering despachos to Pachamama, sweets and flowers in gratitude for her gifts of harvest as they prepare the soils for the next seeds. Even if we are not in Peru we can use these energies to connect more deeply to Mother Earth and be mindful of what we are creating. Can we listen more deeply to what needs tending? What needs clearing? Spend time each day in meditation, contemplation. Journal. Create intention. Make offerings to the Earth, to the waters. Be mindful of spending time in nature. What arises by listening, by turning in? Inspired by the Pachamama Days of Peru, let us imagine a world. I invite you to write below what you imagine a world to be. Let us create a collective prayer to offer in ceremony. Your prayers will be written on violet paper, the color of creation, and added to a despacho that I will create and share later in the Pachamama days. I imagine a world where each day we greet Pachamama with a song, a song that rises from our love for our Mother Earth, a song that sings our gratitude to her. 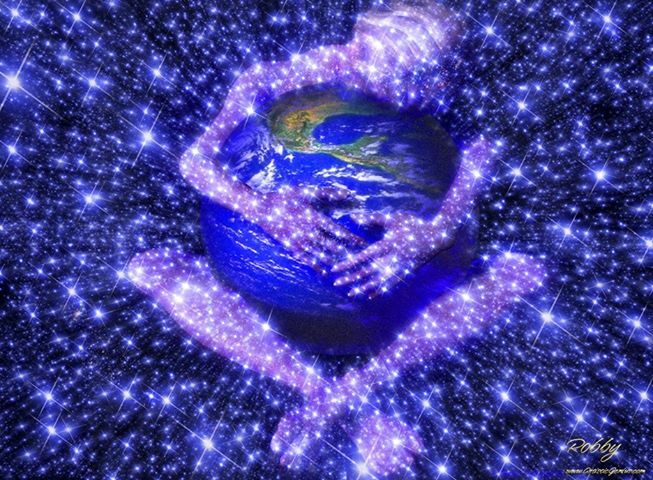 How would the vibration of our world change if each and every soul sang the song of their heart? It is through imagining we create a new world. May we open our ceremony with a song to our Beloved Mother. This song was birthed by Tracey St. John at Empowerment Camp on June 20th at Feathered Pipe Ranch this summer. I have not stopped singing it since. Click on the picture below to hear the song and sing along! your prayer to our collective vision. and say thank you for what we are creating today.